Less than a month ago, we reviewed the Fuji Xerox DocuPrint CM315 Z. The ‘M’ in the model name denotes that this device is a multifunction printer. Today, we’re reviewing the Fuji Xerox DocuPrint CP315 DW. The ‘P’ in this model’s name denotes, you guessed it, folks, the fact that it is a single-function printer. Essentially, the technology is identical in the two devices. At the same time, though, there are some differences in the components of the two devices. You see, a multifunction printer has a different target audience than a single-function printer. In fact, there is a significant difference between a person wanting the ability to print, scan, copy, and fax and a person just wanting to print. Generally, this difference boils down to: the former will want a more powerful device. This is true here. 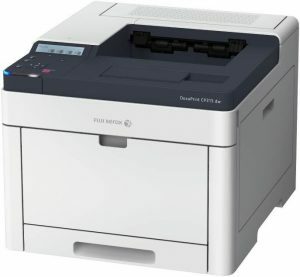 The Fuji Xerox DocuPrint CP315 DW is much less advanced than the Fuji Xerox DocuPrint CM315 Z. So if you’re tempted to skip this review because you read that one, don’t. You should read this review especially if you’re in the market for a colour A4 laser printer. 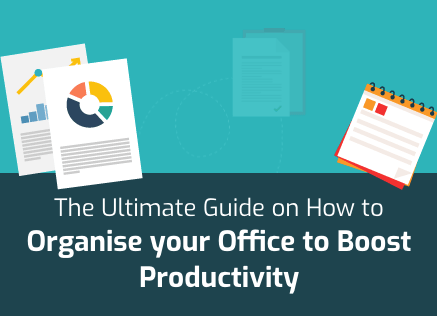 The device may prove to be a good fit for your business, regardless of whether you have a Small Office / Home Office (SOHO) setup or medium scale operation going on. The biggest draw of the Fuji Xerox DocuPrint CP315 DW is its output quality. For a laser printer, the DocuPrint CP315 DW’s output quality is excellent. Most laser printers deliver superb text but this device excels because it delivers great graphics and images too. Remember, this is a colour printer and it isn’t easy for a laser printer to deliver good colour prints. The Fuji Xerox DocuPrint CP315 DW achieves great output quality on the back of Fuji Xerox’s Set-Type Thyristor Logic S-LED (STYLS) and Current Confinement Self-Scanning Light Emitting Device (CCSLED) technologies. These technologies combine to give this device a maximum output resolution of 1200 x 2400 dots per inch (dpi). While the print output of the CP315 DW is truly exceptional, it is important to not go overboard with it. 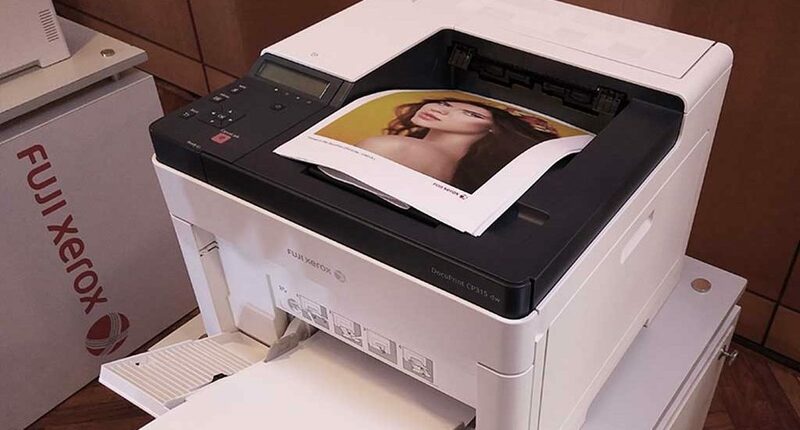 No matter how great this device’s output is, it cannot be compared to a dedicated photo printer or even a significantly advanced business printer. It does come close, though, and that must be celebrated. 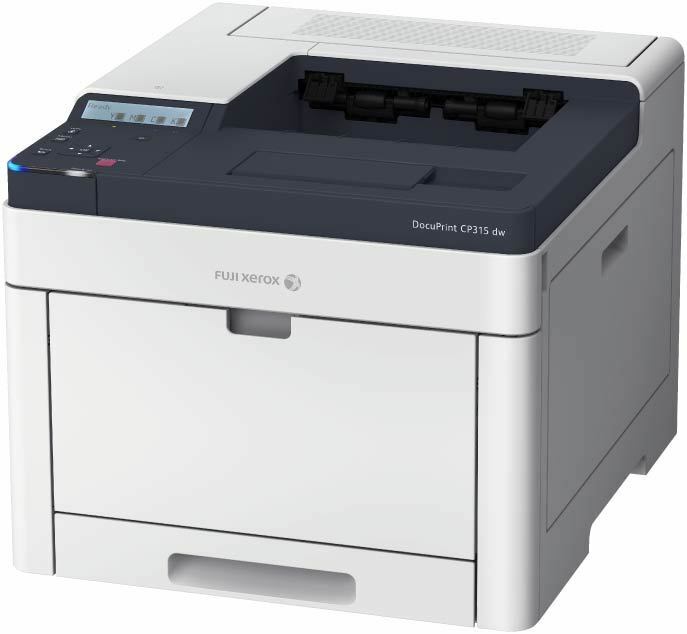 Apart from output quality, the other area where the Fuji Xerox DocuPrint CP315 DW excels is connectivity. The Original Equipment Manufacturer (OEM) has loaded this device up with all possible connectivity options including Near-Field Communication (NFC) and Wi-Fi Direct. The usual options such as USB 2.0, Ethernet, and wireless are available as well. The device is mobile compatible also and can support various third-party services. It supports Air Print, Google Cloud Print, Dropbox, One Drive, Google Drive, and Mopria. The Fuji Xerox DocuPrint CP315 DW will help its owners save on paper costs because one of its features is automatic duplexing. Automatic duplexing will allow users to print on both sides of the page. Resultantly, it has the potential to reduce paper costs by half. The biggest problem with the Fuji Xerox DocuPrint CP315 DW, as was the case with the Fuji Xerox DocuPrint CM315 Z, is cost. This device is expensive. It is expensive to acquire as well as expensive to run. This could be attributed to its excellent output quality but it is still something that will put off many potential buyers. The list price of the CP315 DW is $850. If you shop around, you may find cheaper options in the neighbourhood of $775. When it comes to running costs, using high yield cartridges will help. If you use high-yield cartridges manufactured by the OEM i.e. 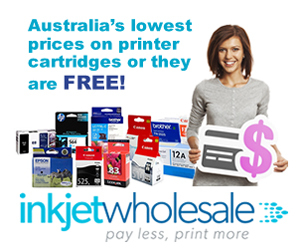 genuine cartridges, you can expect to spend about 19.78 cents for every page you print. On the other hand, using aftermarket manufactured cartridges i.e. generic or compatible cartridges will lower your running costs to as low as 16.70 cents per page. The Fuji Xerox DocuPrint CP315 DW comes standard with a paper capacity of 300 sheets split between a 250-sheet paper tray and a 50-sheet multipurpose tray. It is this aspect that makes it good for the SOHO market. However, the high acquisition cost may put it beyond the reach of most customers in that market. In contrast, the fact that you can enhance this paper capacity makes this device suitable for the small and medium scale enterprises. You can take this machine’s paper capacity to 850 sheets with the addition of the optional paper tray with a capacity of 550 sheets. Be wary, though. This extension will increase the acquisition cost further. The print speed of the DocuPrint CP315 DW is neither great nor poor. It sits smack in the middle of the accepted benchmarks for this market segment. This machine’s rated print speed is 28 pages per minute (ppm) for both monochrome and colour printing. Where the CP315 DW does stand out is the fact that duplex printing doesn’t halve its print speed. If you print with the automatic duplexing mode on, your print speed will only go down to 18 ppm. The Fuji Xerox DocuPrint CP315 DW is smaller and slightly more compact than the Fuji Xerox DocuPrint CM315 Z. This device measures 347mm in height, 480mm in depth, and 420mm in width. It is also lighter than the CM315 Z. It only weighs 23.7 Kg. 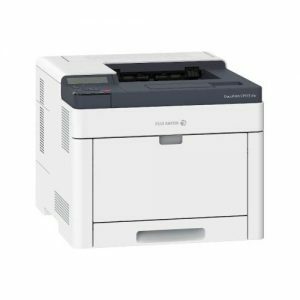 You’ll still find that the Fuji Xerox DocuPrint CP315 DW is heavier than many of its present-day counterparts from other OEMs. This can be explained away by the fact that the housing of this device is much sturdier and durable than its competitors. Just by touching the CP315 DW, you can get a sense that it is strong and reliable like that. Inside its strong body, you’ll find an ARM Core 733 MHz processor along with a 512MB RAM. The CM315 Z possesses a 1GB RAM but it doesn’t make much difference here. The first print-out times of both devices are identical. For colour prints, the devices take 9.2 seconds to spit out the first page while monochrome prints are delivered within 8.2 seconds. The control panel of the Fuji Xerox DocuPrint CP315 DW is simplistic in comparison to the Fuji Xerox DocuPrint CM315 Z, which features a customisable touchscreen. The control panel of the CP315 DW comprises a single-line display screen and a few traditional buttons for some basic functions. Fuji Xerox is offering a 12-month onsite warranty with this device.